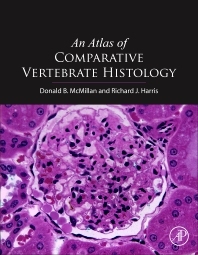 Atlas of Comparative Vertebrate Histology looks at the histology of a wide range of vertebrates, representative of all the major classes and families, with examples ranging from amphioxus to primates. The authors focus their microscope on commonly seen vertebrates as well as ‘non-standard’ species, such as lamprey, hagfish, dogfish, skate, rock bass, cod, river catfish, toad, amphiuma, leopard and bull frog, garter and brown snake, Coturnix quail and cowbird. The study of comparative histology in the vertebrates helps students and researchers alike understand how various groups have addressed similar problems, opening doors to interesting research possibilities. Not all vertebrates follow the mammalian model of tissue and organ structure. When dealing with unique species, we see some structures taken beyond their ‘normal’ function. Comparative histology allows us to understand the structural responses underlying the physiology unique to each vertebrate group.